A fear of spiders isn’t uncommon, although often unfounded. I know of far more people who have been bitten by dogs or scratched by a cat than have been bitten by a spider. Sometimes fear can be turned into fascination once we understand more about something. A fascinating aspect of spiders is the webs they weave – not just the intricate nature of the construction, but the silk used to spin the web, which is the strongest natural or synthetic fiber known. Spider silk is made up of complex proteins. Researchers have been keen to figure out how to replicate spider silk, but have so far only decoded the silk’s DNA for a handful of species of spider. Spiders create different types of silk depending on the application, with some species may create up to 8 different silk types. The interest in creating spider silk based products for applications such as ropes and protective clothing becomes apparent when you look at the properties of the silk. According to Wikipedia, spider silk strength is better than that of high-grade steel and is as strong as Kevlar; which is used in bullet proof body armor. It’s very lightweight and it would only take a strand of spider silk weighing around a pound to encircle the entire planet. Some webs are strong enough to capture small birds and bats. Spider silk is able stretch up to 140% of its length without breaking and retains its strength below -40 degrees Celsius. Spiders are great recyclers too when it comes to their silk. After a couple of days, the web strands lose their stickiness – so the spider eats that section and weaves a new one. While silkworms have been farmed for their silk for thousands of years, there hasn’t been much success in spider farming or harvesting spider silk as they can be cranky little critters with have a tendency to eat one another. However, that doesn’t mean to say there hasn’t been any success. An example of just how beautiful spider silk can be as a fiber for textiles is captured in this cloth, made from the silk of the golden-orb weaving spider. From an embroider cape made of spider silk. An image of the full spider silk cape can be viewed here. I’m not one for fashion, but I found this to be absolutely stunning. 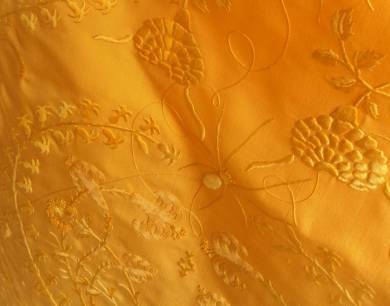 Aside from the amazing workmanship, what you see is the natural color of the silk. According to the accompanying report on the ABC, 1 million female golden orb spiders contributed to the 4 metre (around 13 feet) cape. Spiders were capture in the highlands of Madagascar each morning, harnessed in special equipment and their silk extracted; then returned to the wild. I’m not sure how the spiders felt about the whole ordeal though – and if they are the same golden orb spider we have here in Australia, the handlers would have been risking a nasty bite. Synthetic spider silk research is ongoing using genetically altered bacteria and also, would you believe it, transgenic goats. These goats have been genetically engineered to produce milk high in spider silk proteins. Who knows, maybe there’s a gregarious species of spider out there that can be farmed for silk, just waiting to be discovered – another reason why pristine habitats need to be preserved. Trivia – there are well over 30,000 species of spider and only 200 species have bites that can cause health problems in humans (allergic persons aside) – less than 1%. Three species of spider go extinct each year.